Since my last blog post, I made the transition back to the States. It was definitely a bittersweet journey after several years overseas and four years in Japan. But we did return to the States just in time for fall, which means pumpkin EVERYTHING (and that brightened my spirits)! While I love all things pumpkin, I have also been dreaming of all the kabocha, or Japanese pumpkin, treats I would get in Japan. With its green edible exterior, kabocha doesn’t look like what we think of a pumpkin but the sweet inside is delicious. It has a creamy texture that is different from pumpkin making it great for roasting, simmering or grilling. Japanese use kabocha in both savory and sweet dishes. Some of my favorite fall sweets included kabocha pudding, kabocha pie (a take on the American classic at Starbucks) and of course, Kit Kat’s seasonal pumpkin variety. For savory dishes, there’s the popular bento dish called kabocha nimino which is the kabocha simmered in soy, mirin and dashi broth. Many yakiniku restaurants (grill-at-your-table Korean BBQs) offer kabocha slices with their vegetable platters. My husband and I were huge fans of kabocha and would buy some weekly in Japan. One of our favorite ways to prepare was to place the slices on the grill with a little olive oil, salt and pepper. After it was cooked, we’d drizzle with balsamic vinegar. For an indoor version, we would chunk the kabocha and roast it, then drizzle with balsamic vinegar. Kabocha has great versatility that lends well to other cuisines. I would use kabocha in spicy Thai curries or the recipe below where I created a culturally mixed dish for Thanksgiving dinner. While it’s taking me awhile to transition stateside, I am happy to be picking up a kabocha squash tonight from our local CSA (community supported agriculture). I had to pay extra for it but for a little taste of Japan, it is well worth it! This is the perfect mix of “east meets west” that I developed for Thanksgiving dinner while we were living in Japan. There were no American sweet potatoes and Japanese sweet potatoes were too fibrous and less sweet to sub into the traditional casserole. I saw this purée recipe and figured I’d give it a try. 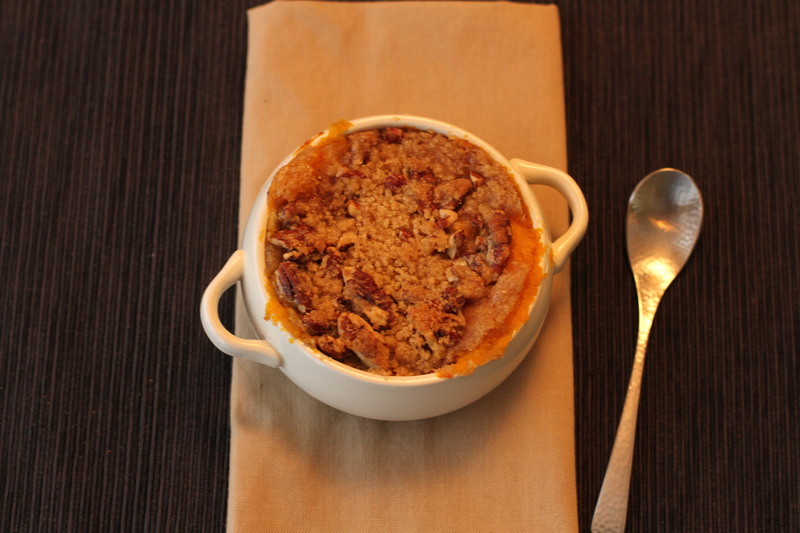 The streusel was a last minute addition to give it more of a traditional Thanksgiving feel. Preheat oven to 375 degrees F. Line a rimmed baking sheet with foil. Lightly oil the squash and season with salt and pepper. Place squash, cut side down, on prepared sheet. Roast kabocha for approximately 1 hour, or until fork is inserted easily. Let cool slightly. Line a strainer with a double layer of cheesecloth; set over a small bowl. Pulse ginger in a food processor until finely chopped. Transfer to prepared strainer. Gather edges of cheesecloth together; squeeze tightly to release ginger juice into bowl. To make the streusel, combine flour and brown sugar together until well mixed. Gently cut in butter until it resembles coarse sand. Mix in pecans. Scoop squash flesh into a food processor. Add sugar and 1 Tbsp. ginger juice. With machine running, gradually add up to 1cup cream and purée until smooth, adding more cream by the spoonful if too thick. Season with salt, pepper, and more ginger juice, if desired. Place in greased casserole dish, or ramekins for individual servings. Top with streusel. Bake at 350 for 30 minutes, or until warmed through and streusel topping is slightly browned. I made these when menu planning for Thanksgiving and it was delicious. It would work well for small gatherings, or small Japanese kitchens! This recipe I created got me 2nd place in their best ice cream recipe. It’s one of my most requested!